Are you the type who gets easily startled by things that go bump in the night? Well, here’s a slot game that promises you some tantalising rewards that you can stand to win if you are willing to gamble with the creepy crawlies in this dark attic. 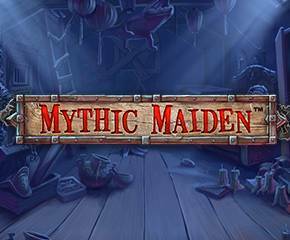 Let the Mythic Maiden decide if you are worthy player as you spin the reels with her in this fun little horror slot. Mythic Maiden has been developed by NetEnt, a Scandinavian casino game developing company that is known for having developed some of the most entertaining video slot games that are available today. These slot games are known for their excellent game design and animation, all of which make them a great experience for any gambler. 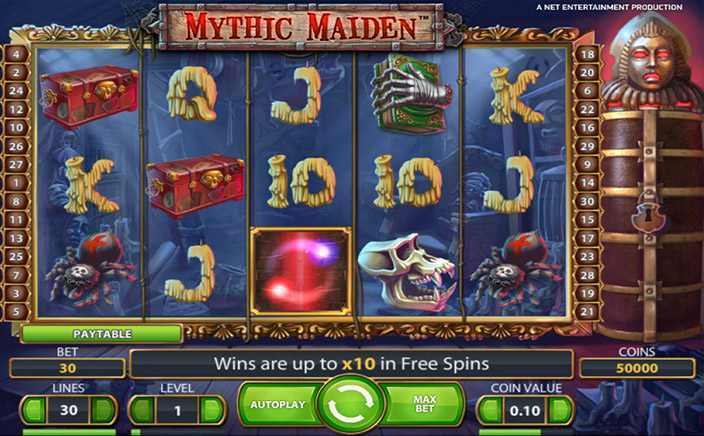 Mythic Maiden is a 5 reel, 30 payline video slot game, which is based on the theme of a dark, creepy looking attic where anything might be staring at you out of the darkness. To the right of the reels you will find yourself the Mythic Maiden herself, because, well, why not?! To begin your gameplay, you can choose the value you want to start betting with and then click the spin button. This will trigger the reels spinning and you can try to make your fortune using the symbols that present themselves on the reels. Wilds: The wild symbol in Mythic Maiden is a symbol of the full moon shining through a shattered glass window. When you see this symbol on the reels, you can use it to swap out other symbols on the reels so that you can get a winning payline. Paylines that contain a wild symbol have a 3x bet multiplier that will increase your winnings even further..
Free spins: The scatter symbol in Mythic Maiden is the circle of light sign. When you get three or more of these signs, you can win some free spins. Three of these signs get you 10 free spins, four circle symbols get you 15 free spins and five circle symbols get you 30 free spins. It is during the free spins round that the Mythic Maiden next to the reels opens up to throw some choice rewards you way, which can be more free spins, or bet multipliers and the highest of these that you can win is a 10x multiplier. Mythic Maiden is a great game for those who are looking for a medium variance slot that has a lot of rewards to offer if you are feeling lucky. Try this slot for some great reel action that is light hearted and rewarding.